I have a gratitude journal that I keep by my bedside that I reach for on nights when I’ve had a hard day. Sometimes I add to the list, sometimes I simply review old entries as it reminds of all the good things in my life. IT has opened my world to so many places and people. Email Management – Automate IT! I don't know about you but keeping up with my email is a daunting task. On an average day, I receive somewhere between 200-400 emails. Sifting through the noise to pinpoint the important messages can be a real challenge. I've always been on a quest to effectively manage my email and am fortunate to have two clients who I feel are shining examples of effective email management. I just returned from a combination business trip and vacation. And while I might prefer to reflect on my vacation; today I thought I'd share with you what I learned from my business trip. I went to Orlando, Florida to participate in a ConnectWise Partner Summit. 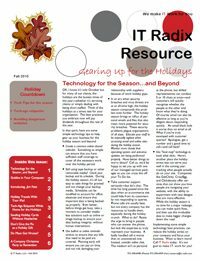 IT Radix continues to stay in the forefront of technology, testing the waters and paving the way for our small-business clients. Our most recent endeavor was testing out a new web conferencing product by SetFocus called The GRID. As the trend towards telecommuting and virtual offices increases, IT Radix as well as many of our clients is faced with the challenge of building a team environment and keeping our remote employees connected. I’m always on the lookout for ways to make things more efficient – be it technology or just around the home. Last Friday I working on a client’s PC and they had over 10 unnecessary programs auto-launching when their computers were starting….no wonder they were complaining that the computer was running slow! It’s a good idea to periodically review the programs that automatically start when your computer. Last week I attended a seminar about social media in the workplace. In particular, they discussed social media on two fronts – the first was tools to manage and monitor your social media activities and the second was to discuss the potential legal pitfalls of social media in the workplace. Heading off for your summer vacation or simply on the road for most the day? As someone who spends a decent amount of time on the go, I’m always on a quest to make the batteries in my electronic devices – be it my cell phone, my netbook or my laptop –last as long as possible. Our recent newsletter talks about taking our technology on the road – we offered a few suggestions on what to take as well how to be safe, but wait, there’s more….here’s more tips to ensure your PC or Mac is ready for its summer road trip. • Remember, there is no such thing as privacy when you’re on a Public network. What amazes me most about the Internet is the wealth of information available at your tips. I use the Internet, email newsletters, and all the new forms of social networking to keep up with industry trends, world news, friends from days gone by, and more.